If you are looking for a Disney Breakfast that is not your typical waffles and breakfast sandwiches, you should head over to the Caribbean Beach Resort. The Spyglass Grill has a great assortment of breakfast dishes that are so good! Where is the Spyglass Grill? 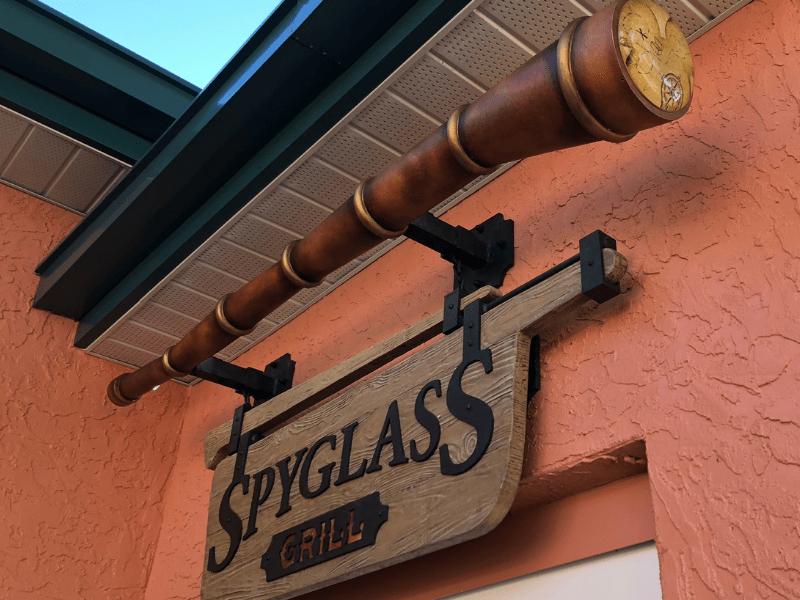 The Spyglass Grill is located at the Caribbean Beach Resort. The resort is huge, so huge that it even has an internal bus system. If you are staying on property, the easiest way to get here is either using the Minnie Van Service or Uber. You can also use the bus system, you just have to get to a park first. Epcot would be the closest. This convenient walk-up counter is nestled in the Trinidad pool area, with a patio overlooking Barefoot Bay. It is outside dining but it is covered and has fans that keep the area cool. The chairs are super comfy and there is even a TV where kids can watch Disney Junior. The first thing I noticed was the free flavored water as soon as you enter. The water was pineapple and lime flavored. It was tasty and went great with the Caribbean flavors of the food. Mobile Ordering is available at this location. My husband had the Cream Cheese Guava-Stuffed French toast. This comes with strawberry syrup (with fresh strawberries) and your choice of bacon or fruit. My husband chose bacon since you can never go wrong with bacon! I took a bite of his dish and WOW! So creamy and delicious! The outside is crisp and the inside is so creamy and warm. You can taste the guava as it has little bits in the cream cheese. Though I occasionally like a sweet breakfast, I prefer a more savory breakfast experience so I had the Yuca Hash. This stuff is so good and packed with flavor! 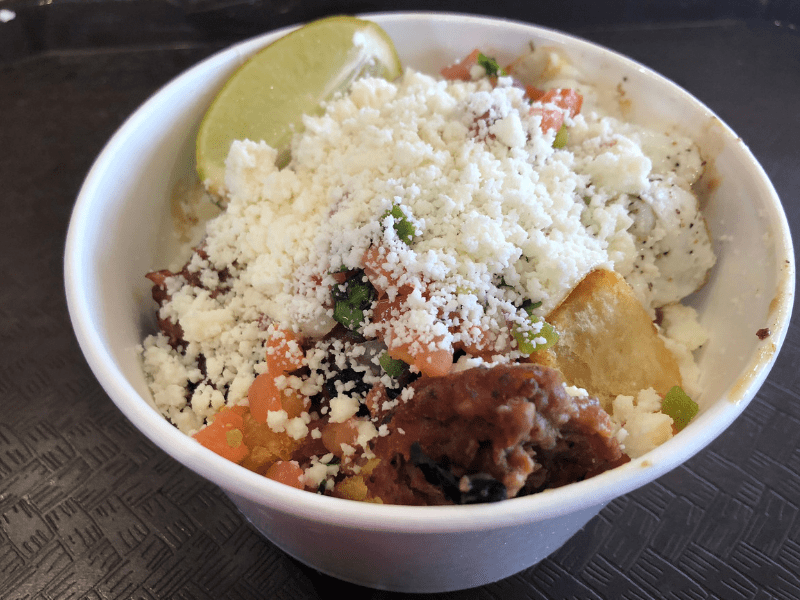 The has included roasted Yuca with Chorizo Redeye Gravy and a Sunny-Side Up Egg topped with Pico de Gallo, Cotjia Cheese, and a lime. It is a bit spicy but oh so good! The picture does not do the food justice as all you really see is the cheese and not all the ingredients. Other menu items that looked amazing included a seasonal fruit plate served with guava yogurt and pineapple-banana pancakes topped with streusel. You can see the entire Spyglass Menu on the Disney Website. Since I enjoyed the breakfast so much I thought I would go back and have lunch there too. The lunch and dinner menu is the same. Though I did like the lunch, the breakfast was the best. For lunch, I had the Chorizo burger which is a grilled 6 oz Chorizo patty topped with Crispy Pork, Provolone Cheese, a Pink Sauce, and Crisp Potato Straws nested on Iceberg Lettuce and Tomato in a Brioche Bun served with a side of Onion, Pickle and Plantain, and Yuca Chips. That was the menu description and my sandwich did not have all that and was a little disappointing, to be honest. The Crispy pork was sort of like a small, overcooked piece of pork chop stuck on the burger. The pink sauce tasted like a mayo-based sauce, but I could not really detect any other flavor. 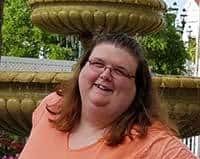 I absolutely loved the chips! The plantain and yuca chips are house made and were so good. You can order just the chips as a snack and they come with Pico de Gallo and Mango Chutney. That would have been amazing to try. My husband liked his selection of the Yuca Bowl with fish. 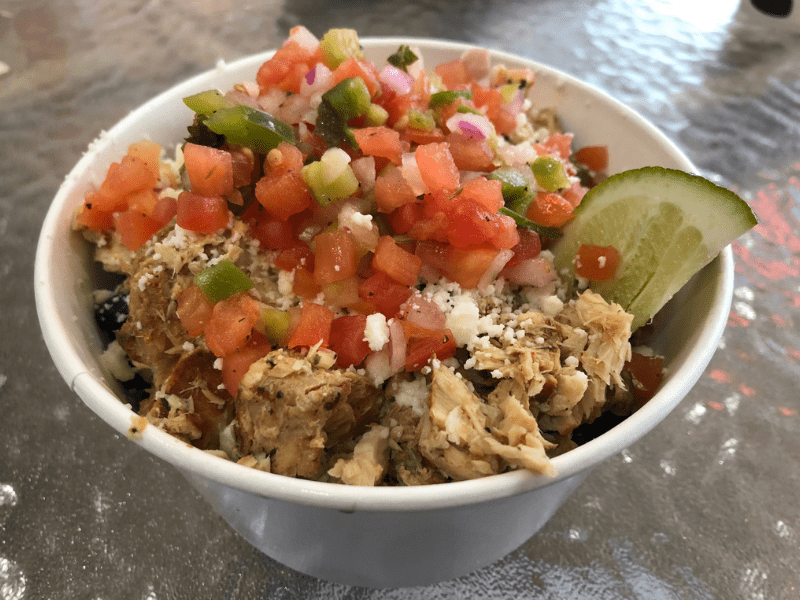 Here is the menu description: covered with Black Beans, Pico de Gallo, Cotija Cheese, Cilantro and a Lime over Crisp Yuca. You get to pick your protein and he chose fish. He said the fish was a little overcooked but that is typical of a Disney quick service. The dish was basically the same as my breakfast bowl minus the egg and add the protein so I would order that if I went again or maybe the tacos, which looked tasty as well. 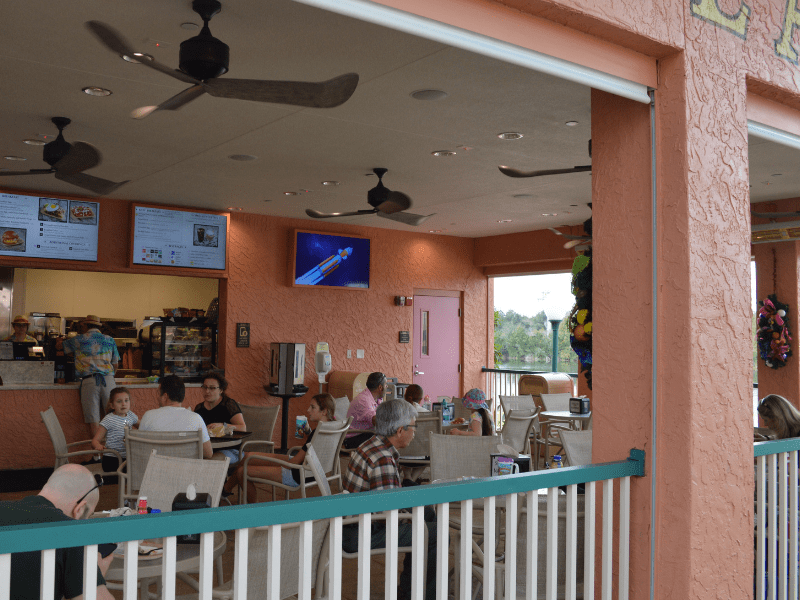 Disney’s Spygrill at Caribbean Beach is a hidden treasure for a breakfast spot and an ok lunch spot. I would say it was worth the price even if paying out of pocket and good use of your Quick Service Dining Credits. 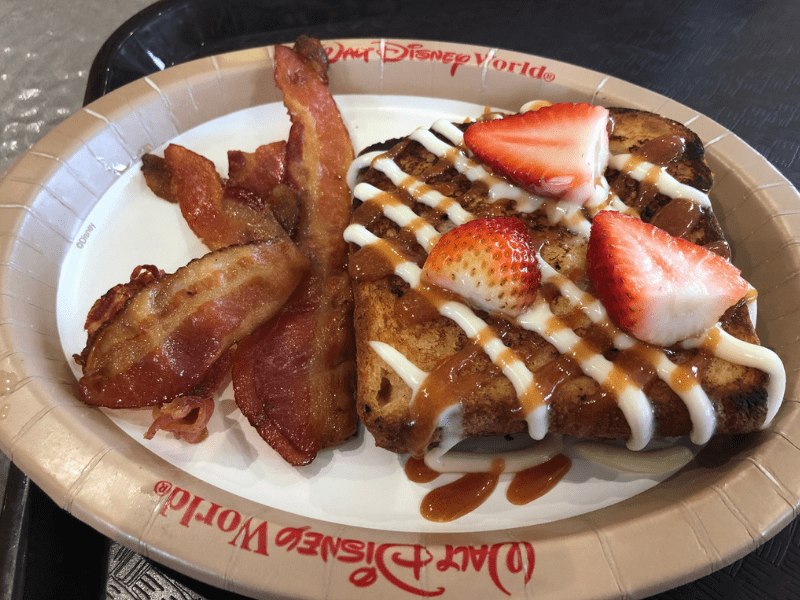 If you are looking for more than Mickey Waffles (though they have those too) then this is one of the best breakfast quick service places on Disney property! Ooooh! Looks so good! I definitely want to try Spyglass Grill on our next trip. Have you been to Sebastian’s yet? I have not been to Sebastian’s yet. It is on my list of places I have yet to try. 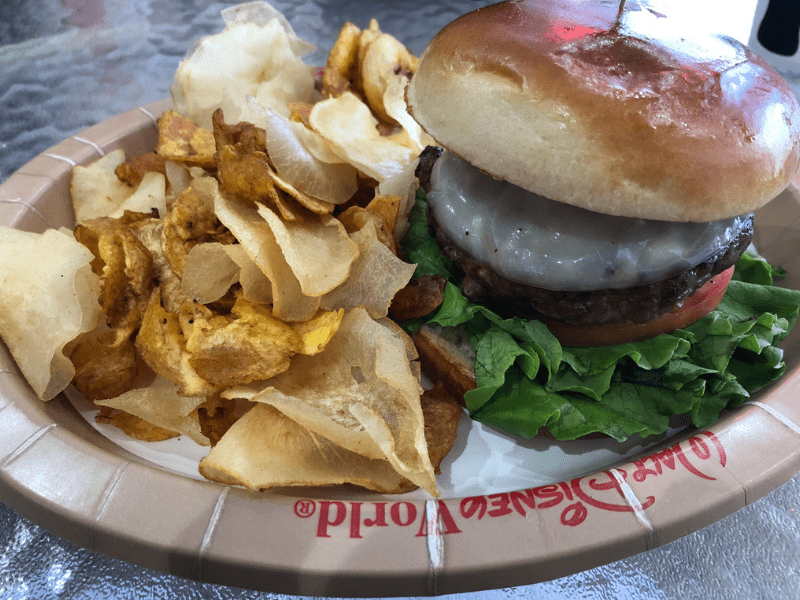 So many amazing dining options at Disney outside of the super popular places!